HMD Global has come out with a lineup of 3 Android-based Nokia phones in quick succession at different price ranges, the Nokia 3, Nokia 6, & the Nokia 8.The Nokia 3 is the low budget model while the 6 and 8 are mid and premium segment respectively. We’ll be checking if the Nokia 3 is value for your money. The Nokia 3 will be competing with the likes of Xiaomi Redmi Note 4 & Moto G5 and one of the reasons it can succeed is because of the stock Android experience with the promise of regular updates, including Android O. The phone looks very similar to the legacy Lumia models with a polycarbonate back and metal frame, a change from all metal unibody phones in the market. There are a Matte Black and white Silver variant currently being sold with volume and power buttons matching the colour, on the right edge.It’s a dual SIM phone with dedicated expandable storage slot unlike the hybrid slot phones currently being sold. Surprisingly there’s no fingerprint scanner on the phone which is now common in this price bracket. Also, the capacitive buttons on the phone are not backlit so it’ll be a hard time if you’re using the phone in the dark. The Nokia 2 has a 5” IPS LCD screen and strong 2.5D Corning Gorilla glass. Although the MediaTek MT6737 with only 2GB RAM and 16GBmemory is a huge disappointment since it’s not helpful if you are someone who keeps multiple apps or games open in the background. The phone lags a bit when playing high-end 3D games like Asphalt Extreme and FIFA 17. Audio and Video files play smoothly though and the single speaker is decent similar to the bundled earphones. The screen is pretty bright but some phones in this price range do provide a better HD screen and that is where the Nokia 3 falters. On the software front, Android Nougat 7.1 out of the box provides a similar experience to stock Android and works lag-free. Features such as disabling notifications, replying from notification screen, split-screen multitasking, Google Assistant ( not available on much higher priced phone models yet! ) are already built in. The front and rear camera are both 8MP. The rear camera clicks god pictures in daylight and autofocus works fast as well. The HDR mode does not always kick in and is evident when in night shots or low light the photos are grainy. The video recording works at 1080p and is just above average. The front camera clicks just average selfies. Thankfully the camera app is simple and easy to use. With continuous usage the battery still lasts well over 12 hours and is a surprise considering it’s only 2630 mAh while other phones in this range do provide anywhere above 2800 mAh. There’s no fast charging so the Nokia 3 takes around 2 hours to full charge. 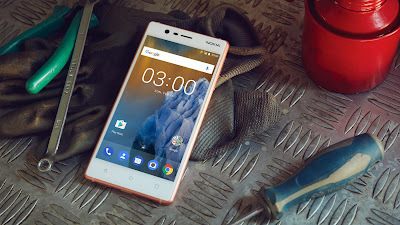 The Nokia 3 is perhaps an average phone for a first time Android phone user but if you’ve been using a phone with similar specs, give this one a miss. There are plenty of phones out there with similar specs at a lower price.